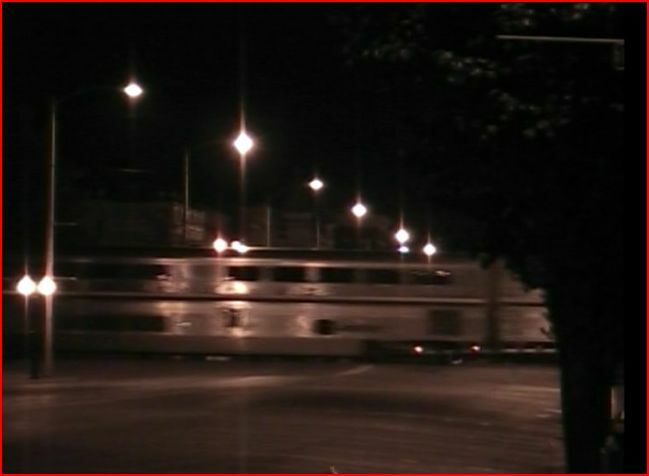 This show has the unique concept of film with trains operating only at night. Some DCP shows contain night footage. 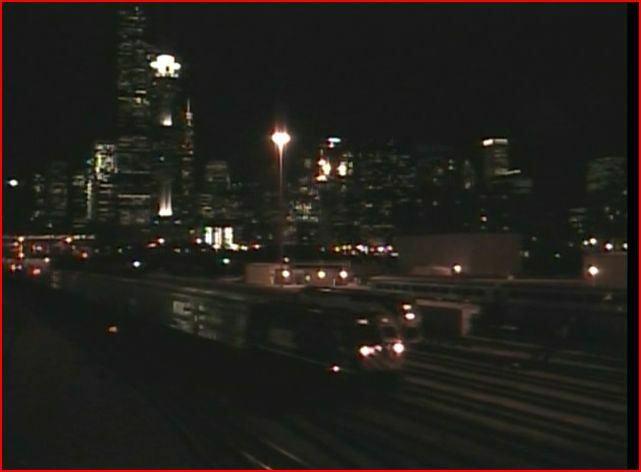 The narrator points out, that not much train photography occurs, after dark. Being that not much can be seen, it makes sense. While an occasional scene can reveal an artistic side of train cinematography, does one need a complete show? Diverging Clear has this compilation, to round-up their nighttime films in a single release. Begins with brief daylight shot video. Proceeds to dusk at Chicago…. Chicago is a rich target environment for nocturnal filming. The behemoth Union Station and the viewed exterior tracks, are well-lit areas. Shiny stainless bi-level commuter cars reflect light. Metra had taken over by this time. So, that unexciting brand of Metra can take on a whole new appearance. This initial city visit is the best of the show. Chicago’s big city background adds to the imagery. Accurate representation of Chitown. Locations move to small town, rural Illinois. 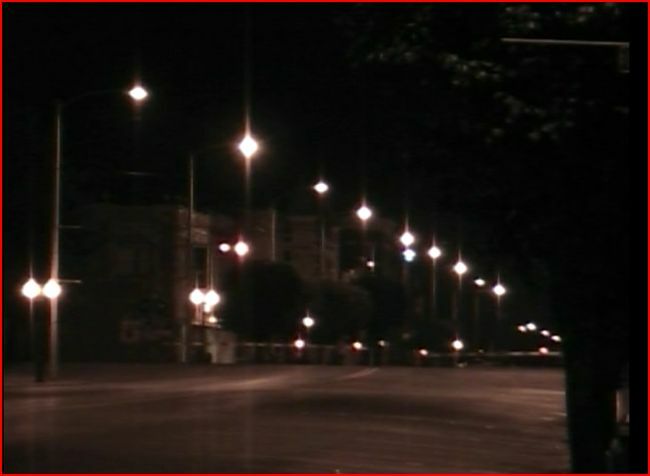 This variety of night footage is what is in other DCP releases. Being familiar with some of these scenes, they are more than just artistic interludes, as in the daylight programs. Now, these bits, are the show. On screen graphics provide the location and train. There is an assortment of views. This Amtrak 58 is an atmospheric sequence. This one contains the essence of Night Trains. 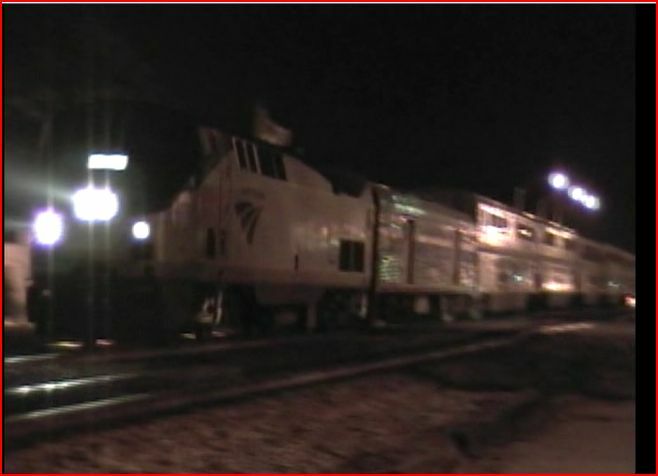 Representative of many night action pieces, in Night Trains. Small towns tend to close down at night. As an airhorn is heard in the distance, the town sleeps. The cameraman waits patiently for the train. Crossing gates drop and guard the desolate street. Horn and rumbling train draw closer. Amtrak City of New Orleans slips through the downtown. Another view from the night. Is this a train, or maybe a UFO? 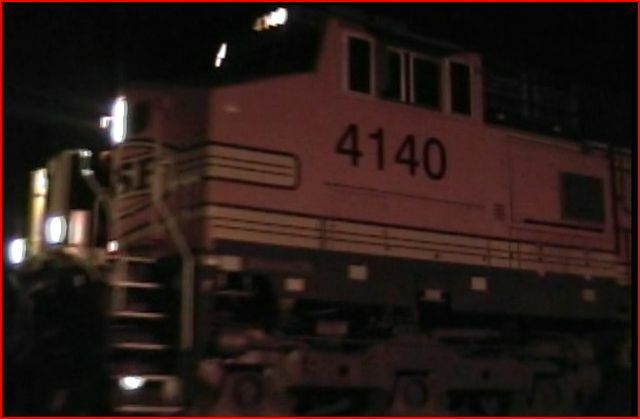 Turns out to be a BNSF coal drag. 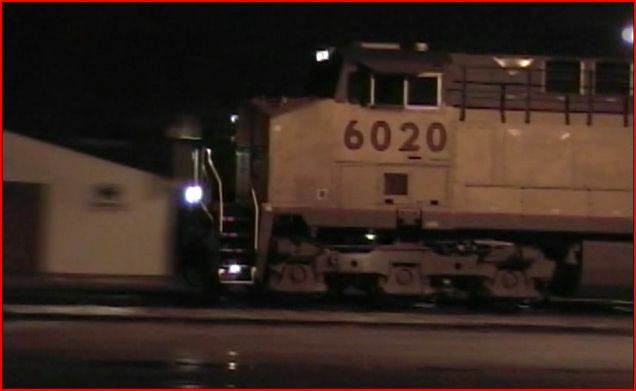 A rainy night yields a wet Canadian National freight train. Must have Union Pacific power reminds us, this is the 21st century. Amtrak City of New Orleans again. By now, you get the idea of a night show. 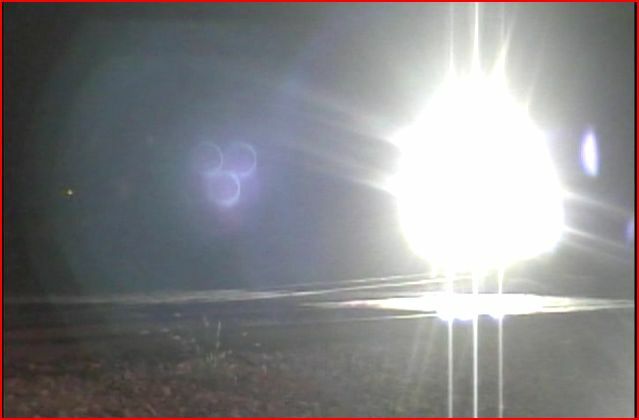 Over an hour and a half of low light level viewing can be tough on the eyesight! Majority of the scenes have visible trains. A small number are just too dark. No chapter menu on this older show. The only narration is near the beginning. Natural audio carries the remainder and it is clear audio. This paper labeled DVD is from an older run. The disc only plays on my computer. It would not play on my DVD player. DCP has upgraded to direct labeled DVD-R. Those discs are reliable ones. 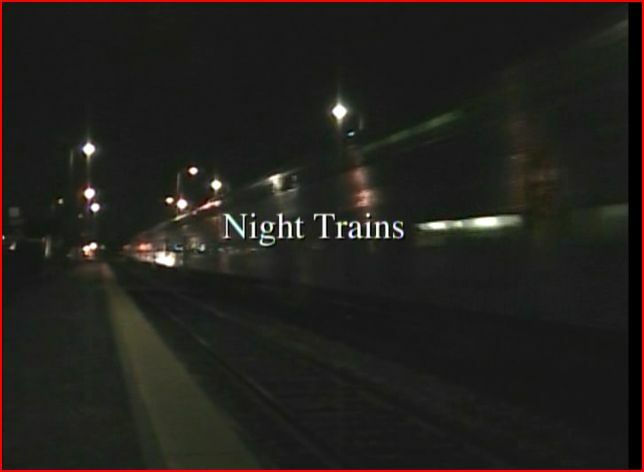 Night Trains presents an artistic viewpoint. For anyone who desires a train video, that is different, here you are! An interesting concept show. 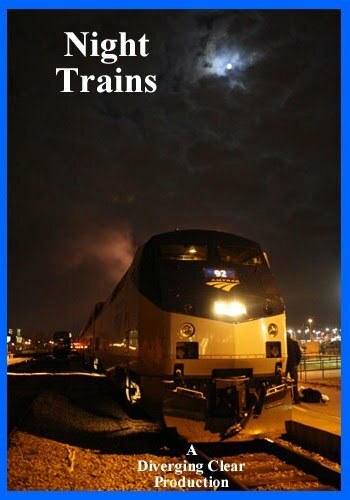 This entry was posted in ATVR Reviews, Diverging Clear Productions and tagged American Train Video Reviews, Chicago railroad, Railroad, Train DVD by William J. Hudson. Bookmark the permalink.